Overcast, windy and a little cooler today, temperature stayed in the low 60's. 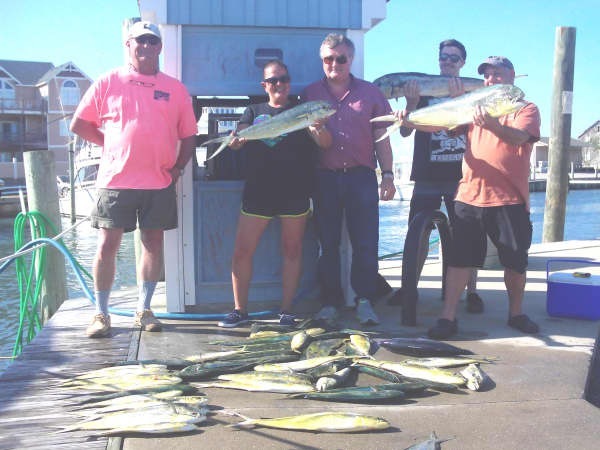 Couple charters faced the wind and headed offshore for a full day of fishing. 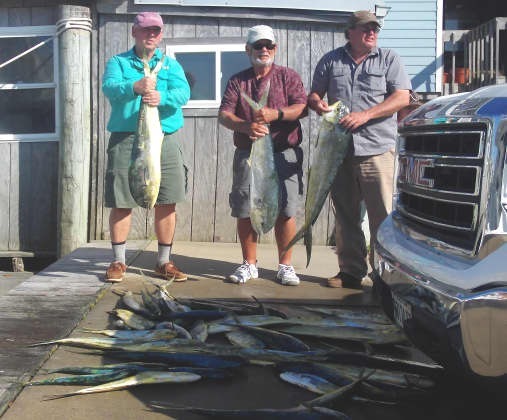 They returned to the dock with good catches of Blackfin Tuna and a few Dolphin. 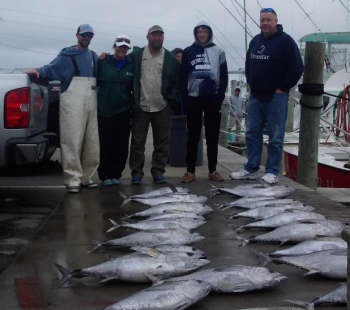 The wind (East 15 - 20 kts) kept the inshore anglers at the dock. Happy Earth Day! Abundant sunshine made for a perfect Spring day, but southwest winds kept offshore boats docked today. A few inshore boats went out and caught some really big Bluefish and a limit of keeper Puppy Drum both this morning and this afternoon. Another beautiful day to be on Hatteras Island! Inshore anglers enjoyed fishing the Pamlico Sound and returned with nice catches of big Bluefish and big Red Drum releases. Some Cobia were caught and schools of Black Drum were spotted. 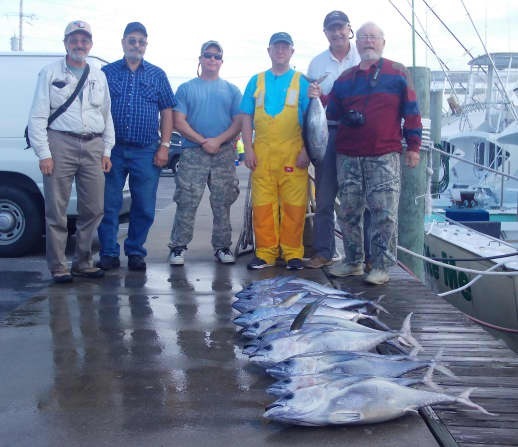 Inshore charters run morning (7-11:30) and afternoon (12:30-5) trips. 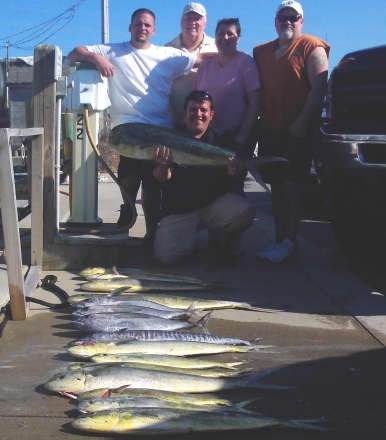 Offshore anglers experienced excellent Dolphin fishing with limits of bailers and some gaffers. The Blackfin Tuna bite continues to be good. 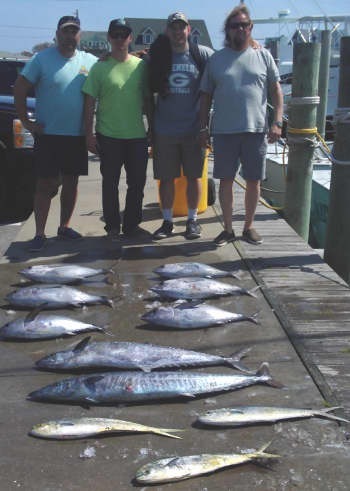 Offshore charters are all day (6-5) and offer some of the best Gulf Stream fishing around! 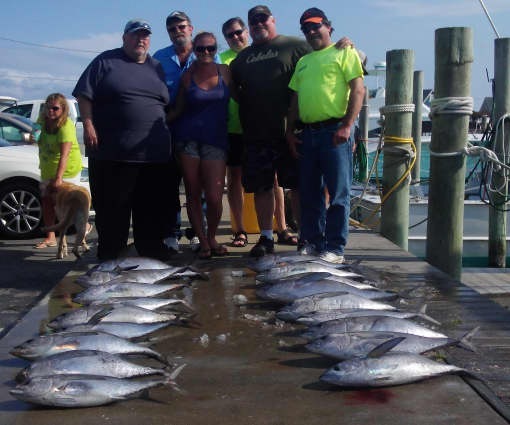 We also set up Make up charters @ $280 for each angler. We are currently looking for several people to fill a Make up charter for Sunday or Monday. Give us a call 800-676-4939 and we'll hook you up! Adam May of Lewes, DE: 50' Black Drum release and 44" Red Drum release on Tradition. Rick Hildebrant of Kill Devil Hills, NC: 42" Red Drum release and 48" Black Drum release on Tradition. Randy Preston of Milton, DE: 41" Red Drum release on Tradition. Adam Hildebrant of Milton, DE: 45" Red Drum release on Tradition. Michael Mitchell of Toano, VA: 50" black Drum release on Tightline. Christopher Mitchell of Willens, VA: 55' Red Drum release on Tightline. Stacey Mitchell of Cap Cotce, FL: 50" Red Drum release on Tightline. Kenneth Gaigler of Ellicott City, MD: 25lb. Blackfin Tuna on Release. Jeremy fisher of Linthicum, MD: 25lb. Blackfin Tuna on Release. Joey Fisher of Arnold, MD: 25lb. Blackfin Tuna on Release. Steven Huntsman of Colora, MD: 20lb. Blackfin tuna on Good Times. Darren McMillan of Dover, DE: 20lb. Blackfin Tuna on Good Times. Daniel Reynolds of Middletown, DE: 30lb. Blackfin tuna on Good Times. Corey Walker of wilmington, DE: 25lb. Blackfin Tuna on Good Times. Kyle McLaughlin of Townsend, DE: 22lb. Blackfin Tuna on Good Times. 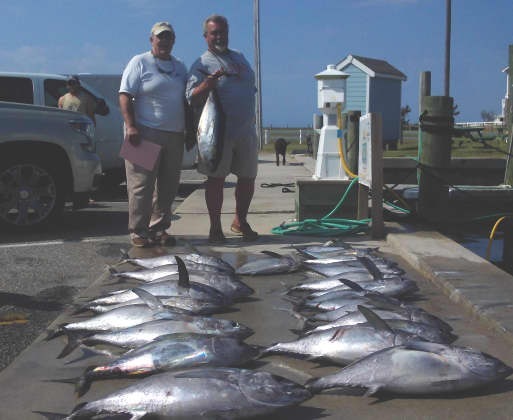 Rudy Middleton of Virginia Beach, 25lb Blackfin Tuna on Carolina Girl. Michael Hall of Moyock, NC 21lb Blackfin Tuna on Carolina Girl. Cole Hall of Moyock, NC 26lb Blackfin Tuna on Carolina Girl. There was quite a bit of activity on the dock today as many people took advantage of this beautiful Spring day to get out on the water. Inshore anglers fished this morning and afternoon and reported large Red Drum releases and good Bluefish catches. 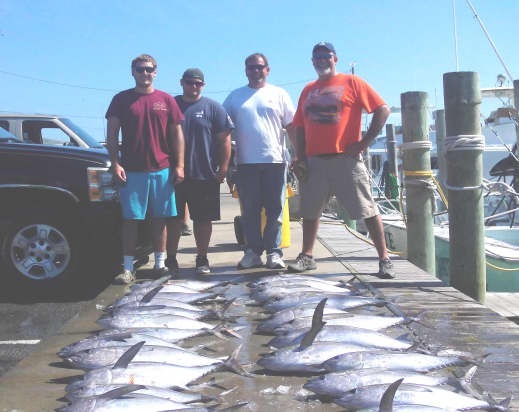 Offshore anglers reported much better fishing conditions than earlier this week. Some boats returned early with full boxes of Blackfin Tuna. 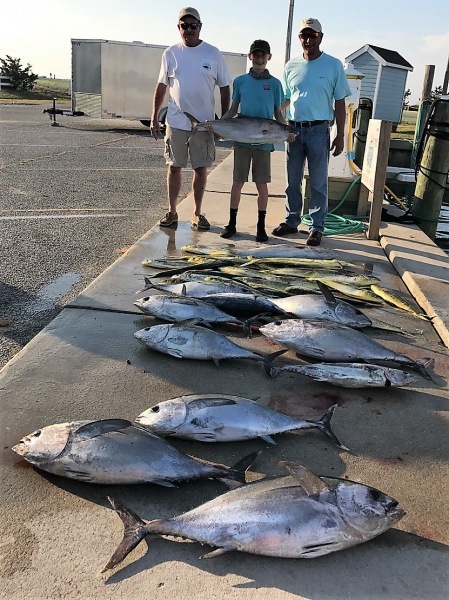 Overall, the Blackfin Tuna bite was excellent and the Dolphin bite picked up to the south and those anglers returned with an excellent catch. David Dees of Newport, NC: 48" Red Drum release on Tightline. Allison Dees of Newport, NC: 50" Red Drum release on Tightline. 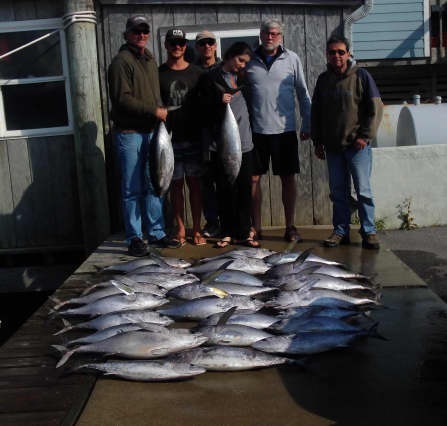 The Bluefish bite was strong again today for inshore anglers. One boat fished offshore and reported choppy conditions along with a good Blackfin Tuna bite. Several charters are scheduled for tomorrow - inshore and offshore - so check back to see what's happening out on the water! Wind was blowing North East at 18-22MPH. This kept the charter boats at the dock but a couple of the Inshore guys were able to head out for the morning session. They returned with large class Bluefish in good numbers. The forecast looks like the wind may be pushing us around for a few days. In the meantime we can get you booked for a day when hopefully the weather is more suitable so give us a call. Our on site Deli is now open for the season Mon-Sat from 11AM-3PM. Today was quiet after the busy weekend. No boats fished today with higher winds moving in. Several boats booked for the rest of the week and makeup trips are in the works. If you want to get out on the water give us a call! The charter boats that went out reported a bumpy ride as the wind picked up towards afternoon. 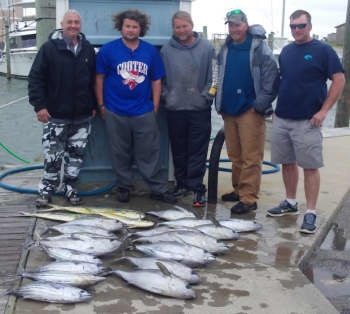 They returned with a mixed box consisting of some Dolphin and Blackfin Tuna while the King Mackerel and Wahoo bites were scattered. Inshore boats had a pretty day on the Sound, happy anglers enjoyed their nice catch of Bluefish! Good weather and Good fishing! Call 800-676-4939 to get in on the action! 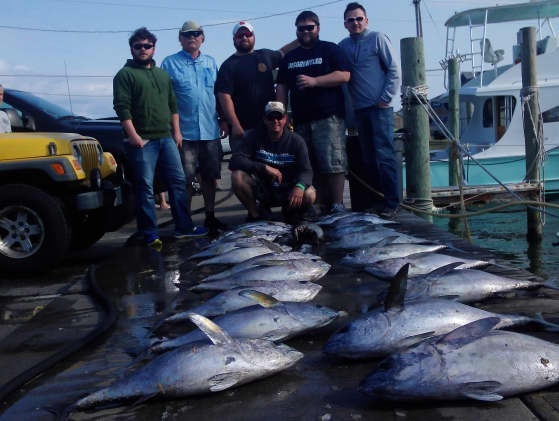 Good Times: Bryson Duffield of Johnson City, IN caught a 25lb, 22lb and 27lb Blackfin Tuna. Another great day for fishing! 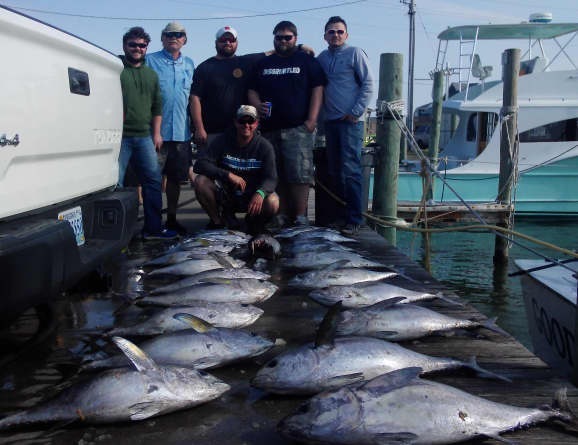 Inshore anglers enjoyed catching Puppy Drum and Bluefish in the Pamlico Sound. Blackfin Tuna provided a good bite offshore today. 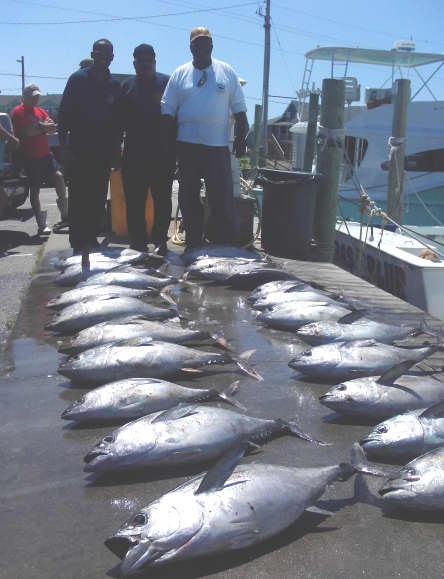 The Yellowfin Tuna and Wahoo bite was scattered. This afternoon the weather turned windy and rainy offshore and it is supposed to blow again this weekend. Danny Radtre of Manassas, VA: 20 lb. Blackfin Tuna on Big Eye. Daniel Tice of Fairfax, VA: 20 lb. Blackfin Tuna on Big Eye. Michael Pittman of Warrenton, VA; 21 lb. Blackfin Tuna on Big Eye. William Valentine of Tobaccoville, NC: 25 lb. Blackfin Tuna on Good Times. Mersudin Ibraaimovic of Winston salem, NC: 22 lb. Blackfin tuna on Good Times. Jeremy Loman of Winston Salem, NC: 25 lb. Blackfin tuna on Good Times. Randy Loman of Lexington, NC: 26 lb. Blackfin Tuna on Good Times. John Liptrap of Pilot Mountain, NC: 32 lb. Blackfin Tuna on Good Times. Chase Brown of Pfafftown, NC: 36 lb. Blackfin Tuna on Good Times. Several inshore charters went out this morning. They reported lots of Red Drum releases as well as some good Puppy Drum catches. Bluefish provided some good bites as well. 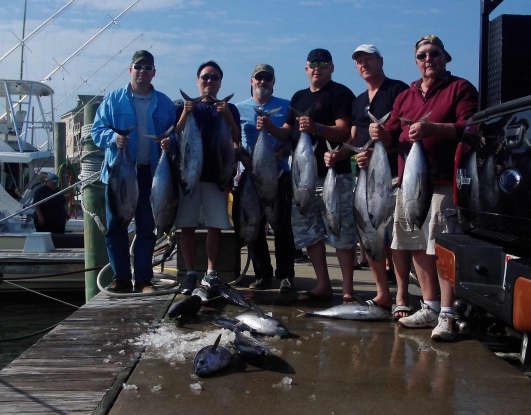 Offshore boats returned with excellent catches of Blackfin Tuna. A few Dolphin and Yellowfin Tuna made it into the fish box today! Enjoy the beautiful weather on this Easter weekend and stay safe! Brian Stanley of Archdale, NC: 40", 44", 3 46", 48", 50" red Drum releases on Adventure. Visnal Chand of Trinity, NC: 46" Red Drum release on Adventure. John Hamelin of Trinity, NC: 41", 44", 47", 48", 58" Red Drum releases on Adventure. Herber Whitley of Lake Wylie, SC: 20lb., 23lb., 25lb.,28lb., 2 34lb. Blackfin Tuna on Carolina Girl. Jack Whitley of raleigh, NC: 20lb., 24lb., 25lb., 28lb., 31lb., 35lb. Blackfin Tuna on Carolina Girl. 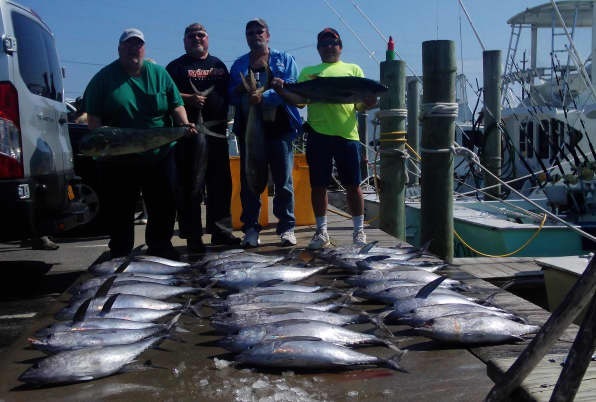 John Gallo of Bayville, NJ released a 95" Bluefin Tuna on Good Times.